Is cooking with ghee any better or 'healthier' than butter? Ghee, left, and its better-known cousin, butter. In a world filled with alternatives for nearly every product — some more healthy, some less — the myriad of options can be downright confusing, if not overwhelming. Meanwhile, butter’s exotic cousin – clarified butter, or ghee — hit the mainstream as a traditional staple in Indian and Asian cuisines. When butter is melted down, the milk solids separate out, and turn brown as they simmer, Taylor Wolfram, a registered dietitian, tells Refinery29. This leftover buttery oil is called "ghee." Most people turn to ghee because they prefer its flavor, Wolfram says. The caramelization process creates a sweet and smokey flavor, similar to butterscotch. It is often used as a substitute for other cooking oils, or slipped into rich drinks like bulletproof coffee. Recently, ghee has gained popularity with people on the Whole30 or paleo diets, which prohibit dairy products. Filtering out the milk fat gets rid of the lactose and casein inside of butter, which is good news for anyone who has a dairy allergy, Refinery29 reports. Ghee is high in omega-3s and butyric acid, a short-chain fatty acid thought to be good for your gastrointestinal tract and digestion, Bon Appetit notes. But it’s worth noting that, because ghee and butter both derive from cow's milk, their nutritional profiles and fat content are very similar, Medical News Today notes. Ghee is also jam-packed with conjugated linoleic acid (CLA), a fatty acid associated with a long list of health benefits. Some studies have found that CLA may be effective in reducing body fat, preventing cancer formation, alleviating inflammation and even lowering blood pressure. Of course, grass-fed dairy provides a higher concentration of this important fatty acid, Dr. Axe reports. One particular perk of ghee over butter is its stability on the shelf. The absence of water means it can be stored without any refrigeration for extended periods of time. Just be sure to keep the jar away from steaming stoves, food and anything else that can introduce bacteria, Bon Appetit warns. 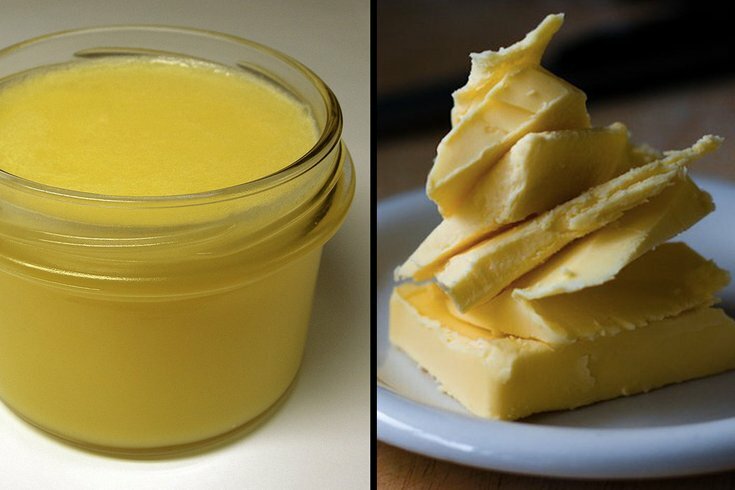 It’s hard to say that ghee is better, or healthier than butter, since their profiles are so similar. Rather, ghee is a slightly more flavorful alternative to butter and its high fat content (similar to butter) makes it a popular option among those following the keto diet.